As Christmas approaches, we love to get into the kitchen and bake. Not only do we send care packages of baked goods to our family but we also love being in the kitchen together. There’s something fun about getting your hands into the dough, getting flower everywhere and oh yeah – the pay off of yummy, chewy, ooey, gooey Christmas cookies with your special someone. I’ll be the first to admit that I’m not the best baker in the world. I like to refer to myself as a cook versus a baker. The reaction of flower with cornstarch, baking soda, eggs and sugar remains a mysterious science to me. I’ve had some real accidents in the kitchen. For example, this year I decided I was going to take on a new recipe of peppermint bark. Easy, right? Wrong! I forgot to put the peppermint extract in the first batch of chocolate, so I added a little extra in the second batch of white chocolate and ended up with something that felt like the minty middle of a York peppermint patty. Mixing it with the regular chocolate and sprinkling crushed peppermint over it, my final product tasted amazing but looked like Santa’s magical reindeer poop. 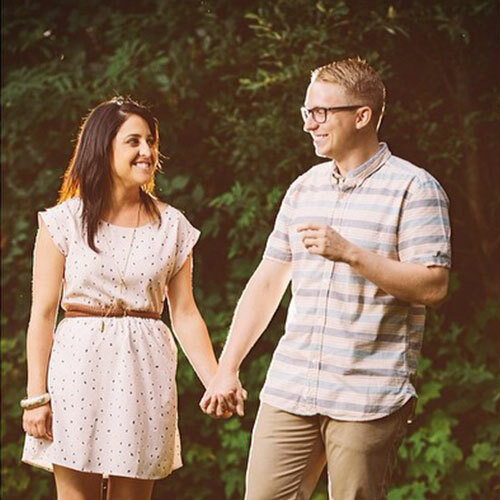 Thank God for my husband! He’s really the baker in the family and it has become our tradition every year to go baking crazy in the kitchen, with his guidance of course. 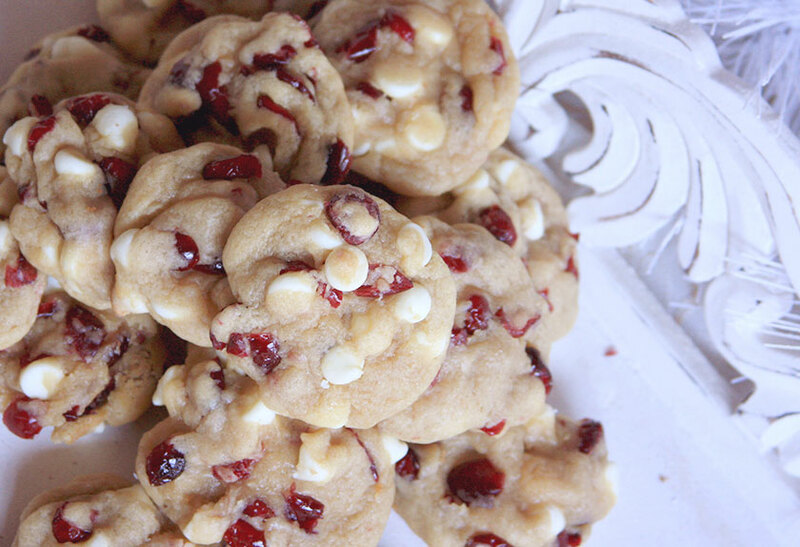 Have no fear, Eric did most of the work with this Chocolate Chip Cranberry Christmas Cookie recipe. When it comes to baking, think of him as the executive chef and I’m the sous chef. I help mix the dough, put it on the baking sheets and take the pretty pictures. If I was in charge of the recipe, we probably wouldn’t be posting it! 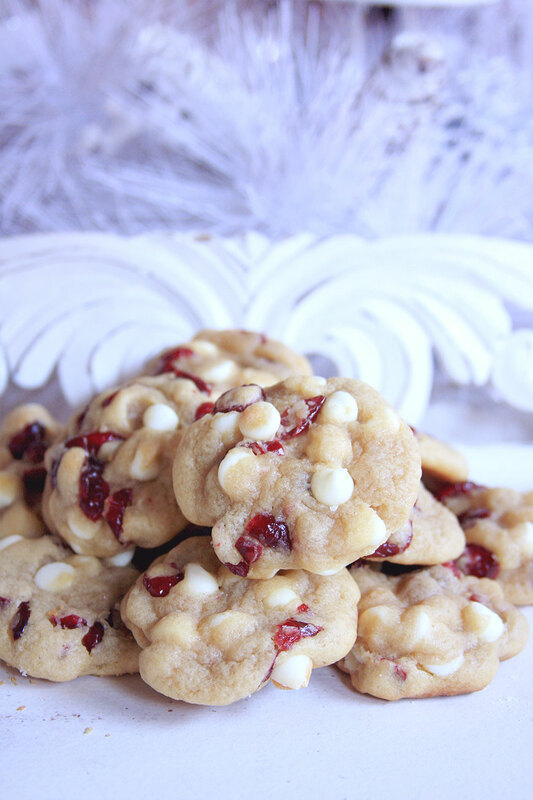 With that being said, enjoy these incredibly soft and chewy cookies loaded with tons of white chocolate chips and cranberries (Eric approved, of course). Melt the butter in the microwave for 30 seconds. Add the butter, granulated sugar and light brown sugar to a mixing bowl and beat until all of it has been incorporated. Add in the egg and vanilla and continue to beat for another 30 seconds. Finally add in the flour, baking soda and salt. You will want the dough to be right between wet and dry (moist is the best description). It shouldn’t be too sticky but also shouldn’t feel too soft like flour. If you need to, add in a little flour at a time until you have the correct consistency. Either leave the dough in the mixing bowl or transfer over to a larger bowl to kneed in the white chocolate chips and dried cranberries. Now, wrap up the mixture with saran wrap or put it into a gallon zip lock bag and place in the refrigerator to cool for an hour. Once, your cookie dough is chilled, preheat your oven to 350 degrees Fahrenheit and lightly oil your cookie sheets. Roll your dough in two inch balls with your hands. These cookies don’t spread much so you don’t have to worry about putting too much space in between them. Bake your cookies for 10 to 11 minutes. You want them barely golden so their soft when they cool. Gently take them off the baking sheet with a spatula and place them on a cooling rack. Let them cool for 15 minutes and then your ready to enjoy some seriously yummy Christmas cookies. This is seriously cool. I’m doing this next year! They’re super yummy. Hope you enjoy! These look delicious! Can’t wait to try! So much (love, hurt, excitement, love, disappointment, joy, exacerbation, love) built into the food experience…isn’t there? HUGS. Haha! True statement! I tend to go on an emotional roller coaster when it comes to baking. Hope you enjoy the cookie recipe!!! That’s what the recipe is there for!